So, let's be honest. Tropical storm Fay was somewhat of a disappointment. I know, I know, you don't all agree. Especially those whose houses were flooded / trees smashed down on cars / general humiliation of being pounded by a woman who sounds like your great aunt. But for me, I felt short changed of the full Florida hurricane experience. Even my non-Florida friends were disgusted commenting "I thought at least your power would be out by now." Still, it appears mother nature heard my noises of discontent and responded by sending over not one but another four hurricane-promising storms. 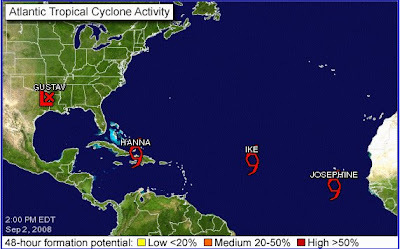 New Orleans got all the fun of Gustav, but we have Hanna, Ike and Josephine still on the cards. Don't get me wrong, however, I don't want to be flooded out. What we're looking for here is a truck load of rain and wind that allows me to return home to the UK with tales to tell, but nothing that involves me being without power and air conditioning for more than a night. (Hear that, up there?! No loss of internet. I do *not* want to be sent back to the stone ages). So hold onto your waterproofs, Floridians, the stormtroopers are coming! I will be safely tucked in at MPA, Munich..will watch the CNN news from FL for signs of your cat..if she tries to escape that is.